We recently got a bit of rain in our area and a whole bunch of weeds sprouted in our neighborhood. Chuck and I found these plants that looked like clover (but I actually don't think they really are clover because they had yellow flowers) in our neighbor's yard. We figured they wouldn't mind if we plucked a couple of leaves to make this craft! 1. We plucked a bunch of "clover" stems. 3. After waiting a day (but we could have waited longer because some of our leaves still turned brown), we had flattened leaves! 4. I taped down a sheet of clear contact paper to a table (sticky side up). We stuck on a clover cut from construction paper . Then, we filled the inside bit with our "clovers" and some gold hearts (made from this paper ) and some pretty sparkles. Then, I placed a sheet of contact paper on top to seal everything in place. 5. Finally, I cut around the clover and then taped it up with clear tape. This craft was so easie peasie and such a nice way to celebrate St. Patrick's Day! 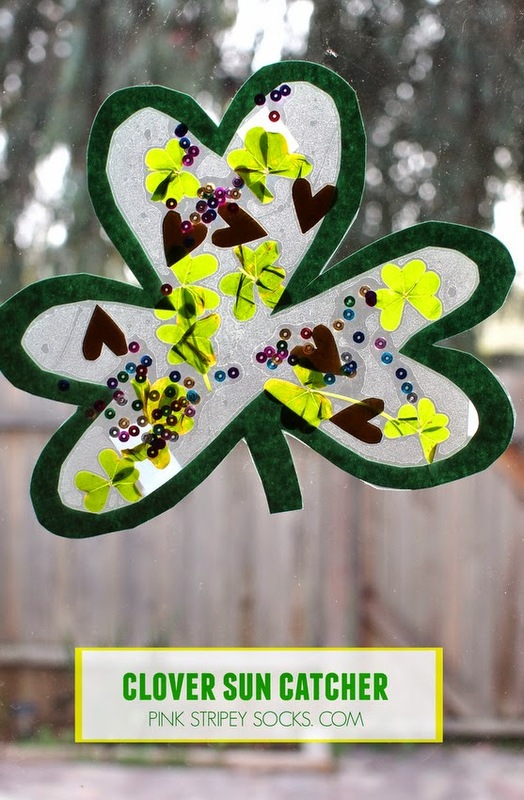 Definitely check out my other 10 stained glass window and sun catcher crafts or 9 St. Patrick's Day crafts and activities like this fun digging for gold activity, CD rainbows activity, or DIY Toilet Roll Leprechaun hat craft.